Two in three Americans are willing to be vaccinated against smallpox, despite the risk of serious side effects, a poll released Wednesday finds. The survey also found an increasing number of people are worried that smallpox, wiped from the globe more than 20 years ago, will return in an act of bioterror. People most trust their own doctors to give them correct information about how to protect themselves from disease caused by bioterrorism — although most regular doctors know little about smallpox and other rare diseases likely to result from an attack. People are significantly less likely to trust government agencies and officials for information, suggesting the government has a big job ahead of itself to educate doctors, who can then pass the information to their patients. "Information about diagnosing and treating diseases used in bioterrorism needs to get to the front lines of the health system — doctors," said the report commissioned by the Robert Wood Johnson Foundation. Among government officials, the most trusted is the head of the Centers for Disease Control and Prevention. Overall, most of the public believes the nation is somewhat better prepared to handle a biological or chemical attack than it was last year, when anthrax was sent through the mail, though only a handful say the country is very well prepared. 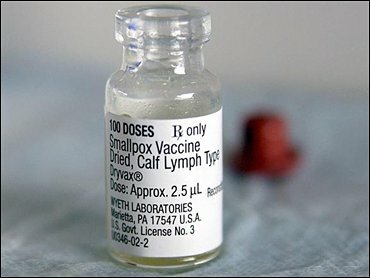 Pollster Michael Perry attributed the heightened concern about smallpox to the increased attention it has received in the media as President Bush nears a decision about offering the smallpox vaccine to the public for the first time in three decades. The president could make his vaccination plan public as early as this week. "A growing number of people have moved from being uninformed about the disease and the vaccine to a state of heightened concern about the possibility of a smallpox attack," Perry said. On smallpox, the poll found that 65 percent of people are willing to be vaccinated although it "may produce serious side effects in a small number of cases." Twenty-two percent said they would not get the vaccine, and 14 percent said they didn't know. In May, 59 percent of people surveyed in a similar poll said they would get the vaccine. The poll found the portion of people worried about smallpox also rose since May. Nearly six in 10 now say they are very or somewhat worried that terrorists will attack with smallpox, up from 43 percent in May. The telephone poll of 1,002 adults was conducted Oct. 20-30. It has a margin of error of plus or minus 3 percentage points. In the poll, the question about getting the smallpox vaccine was asked after a series of questions about the threat of bioterrorism, so people being surveyed may have been thinking more about the threats than about the risks of the vaccine. People were not given details about the vaccine's risks: Fifteen of every million people being vaccinated for the first time will face life-threatening complications, and one or two will die. Smallpox shots involve a number of jabs with a needle containing some live virus. This triggers serious side effects in people with deficient immune systems or skin conditions, like eczema. People who are vaccinated can transmit the disease to others if the vaccinated area is left exposed, and this adds danger to any widespread vaccinations. CBS News Correspondent Sharyl Attkisson reported recently that the president was considering a plan that would vaccinate one million people. In an update of national smallpox policy in November, the CDC said more limited ring vaccinations were the appropriate method for dealing with any outbreak. Ring vaccinations would provide vaccine first to people dealing with patients, then to others most at risk, and then to broader sections of the community if necessary. Ring vaccinations would be "more desirable than an indiscriminate mass vaccination campaign," said the CDC, because of the chances of people who should not get the vaccine getting it and the logistical difficulties involved. In a White House briefing Tuesday, spokesman Ari Fleischer refused to be pinned down on when Mr. Bush would reveal his vaccination plan. "It's a matter that he's approached with care and deliberation. He has, I think, properly and wisely taken time to make his determinations about whether or not to proceed with any type of smallpox inoculation program or vaccine program for the American people," Fleischer said. On Tuesday, states submitted their own smallpox vaccination plans to the federal government. These displayed a variety of approaches, from Georgia— planning shots for just 300 to 500 people — to California, which has requested 70,000 doses of the vaccine.